Sometimes when I think about things I want, but will probably never have, one of those is Splatterhouse toys. If they ever did it would probably work into the PS3/Xbox360 game and not the classic series. Not that there's nothing necessarily wrong with that, I guess. 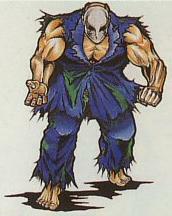 Just my Splatterhouse fandom is for the old 16 bit games and that's the things I specifically would want. Sofubi, pvc, or even good old action figures. Man, would it be great.